R2R, read on your blog about selling CCP. I've been contemplating the same thing but held on just for the fact it's such a small holding in my portfolio. I'm on the fence, "Do I invest or do I sell?" I'm holding onto the investment until I can come to a decision, if I cannot bring myself to allocating more dollars I will eventually divest the security. I'm going to have to sit down and really compare CCP vs. OHI since I also own both. Thanks for sharing, rayray. I sat on the fence for a long time and took my time taking that decision. Eventually I decided to simply sell and take the profit, albeit small. (04-18-2016, 08:51 AM)rayray Wrote: I've been contemplating the same thing but held on just for the fact it's such a small holding in my portfolio. I'm on the fence, "Do I invest or do I sell?" I like to take a bunch of small investments like this. I'll hold them forever and just see what happens. I have no interest in adding to them, really. Examples I have are FHCO, BRCD, RPXC, SOUHY, BAC, CART. (04-18-2016, 10:03 AM)Roadmap2Retire Wrote: Thanks for sharing, rayray. I sat on the fence for a long time and took my time taking that decision. Eventually I decided to simply sell and take the profit, albeit small. I know what you mean, albeit, a different investment I did that with South32 fairly quickly and never looked back, even though I'm down through BHP Billiton. Still, in the long term I feel more confident with BHP Billiton as a diversified commodities supplier then South32 and will eventually add to bring it back up to a full position when the time is right for me. I've held on to my South32 shares since the spinoff, in addition to the BBL shares. I think I'll just hold them forever, as that's my investing personality. I'm going to steal your dividend % chart for my own basic needs starting in 2017! 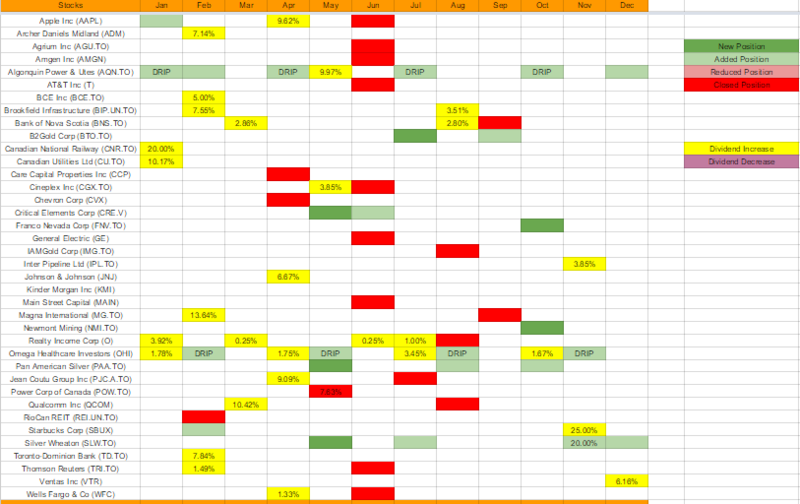 I'll use a different color scheme though : ) It will help me keep better track of dividend increases/decreases throughout the year(s) making me a better investor. When I do a quick read over the blogs, yours is one I check frequently. We kind of started to realign our portfolio's about the same time. While I was readjusting my portfolio I was up to about 32 to 34% in cash, then redeployed some cash back into the market. Right now, I'm averaging between 18 to 20% in cash investments--I'm excluding our residence and regular savings accounts in the total portfolio. I'm still amazed at what you're bringing in per month, kudos! And MAN, I was really taken back with Dividend Hustler's liquidation!! But the guy is no slouch, he's a MONSTER and has a great plan in place for himself and his family. Kind of shocked me that a lot of us moved to cash in and around the same few to several months. Thanks for the kind words, rayray. I am still interested in DGI, but the focus is changing -- Right now I am in a transition state, where a big portion of my portfolio is sitting in cash (about 35-40%), and the rest invested in a mix of index funds and individual stocks. I want to focus on a smaller set of stocks and have a bigger portion of my portfolio in index funds going forward...this way I am not spread too thin by investing in 50 or 100 different companies. Thats too many for me to keep track of and there is no way I can beat an index fund when I do that. For now, I am thinking that I want to invest in approx 20 companies and focus on them. Do you have your portfolio shared here on this forum? I will need to check it out to see what it looks like. I am trying to come up with a shortlist for companies to buy during the next cycle. My dividend income has taken a hit but the "other" field keeps my overall passive income afloat Yes the move from DivHustler caught a lot by surprise. His portfolio was massive and he was bringing in some serious cash over the months. It was interesting that he was putting that money into Vancouver real estate -- which is apparently one of the most expensive real estate markets of the world...but I hope he knows what hes doing. Sounds like a solid plan! That's what everyone needs, a plan that works for them and their family. I'll post my dividend increases/decreases after the first quarter of 2017. Just curious, why did you sell AAPL?